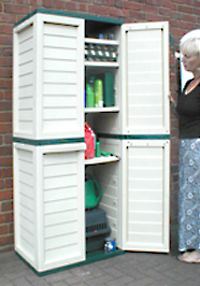 This space saving Large Utility Cabinet/Shed provides over 22 cu. ft of storage behind the easyaccess pad-lockable doors, the shed has 4 adjustable shelves. Manufactured from weatherresistant, UVstabilised polypropylene.